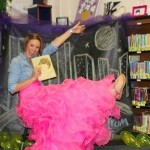 As you may have heard, we hosted a Book Prom in Navasota last Friday, and man, did we HAVE FUN! The #SecretSocietyOfReaders decorated the library and moved out the tables and books to create a dance floor for our readers. When the students arrived to the library, they signed in with their “book date,” and strutted down the royal blue carpet. 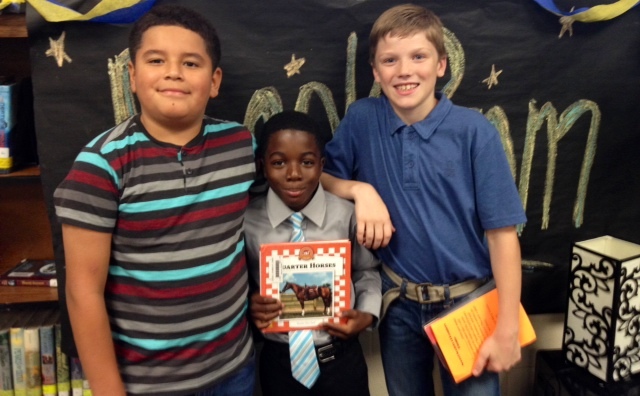 Students were dressed in their finest clothes, and some students dressed up their books too. 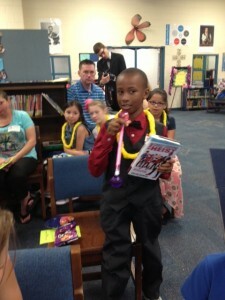 Students and teachers were invited to attend Book Prom, and even the Mayor of Navasota, Texas attended the celebration! After walking the carpet our kids had their Book Prom, posed pictures taken in front of a city backdrop. Guests were then treated to a donated breakfast, and after eating settled themselves for the welcoming ceremony presented by: Sarah Martin, Kevin Bradford and Kathryn French. Each student was given the talking stick, to introduce the book that they chose to take to the prom. Some parents and visitors, even shared their favorite books that they would take to the Book Prom. It was indeed a splendid moment to hear adults from our school district, and community, speak about their love of literacy with our student learners. After the book talks, students voted on which book they thought deserved to be the Book Prom King or Queen. While volunteers scrambled to tally the votes, students danced and did the “Wobble “with their books. I was one happy librarian to watch kids dance, the library was alive with positive energy, and celebration! Students were so excited to have a Skype chat with the wonderful librarian, artist, explorer and book lover! We discussed our favorite books and what we wanted to be when we grow up. 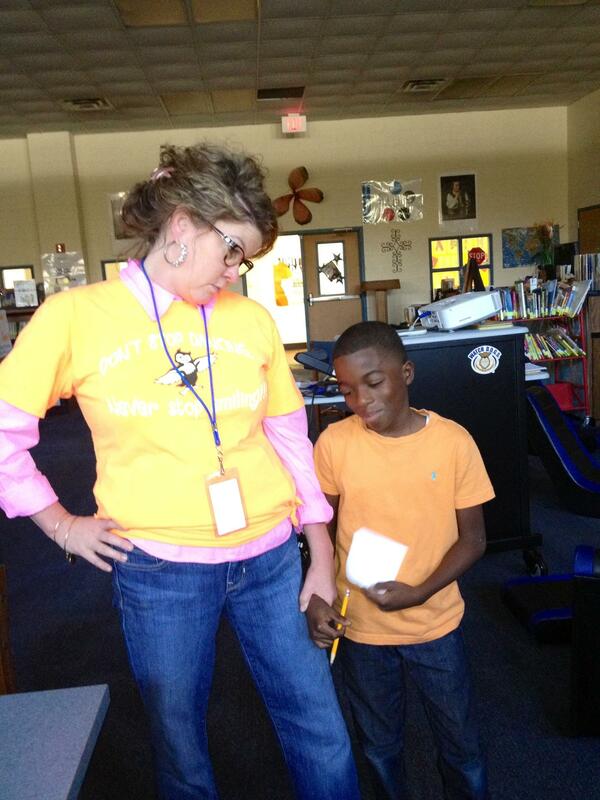 Ms. Miller was kind enough to encourage our students to keep reading. She introduced our students to fresh new books, books that we had not heard of before. Our kids had a blast! When the moment arrived to crown the Prom King and Queen…we all waited, quiet with anticipation…the winners were for: Prom King was the book, Wonder, written by RJ Palacio and the Prom Queen was Divergent, written by Veronica Roth! Of course, those were the MOST popular books in the library this school year! We were all excited. Summer is almost here! And let’s be clear, these students and teachers want to have some fun. 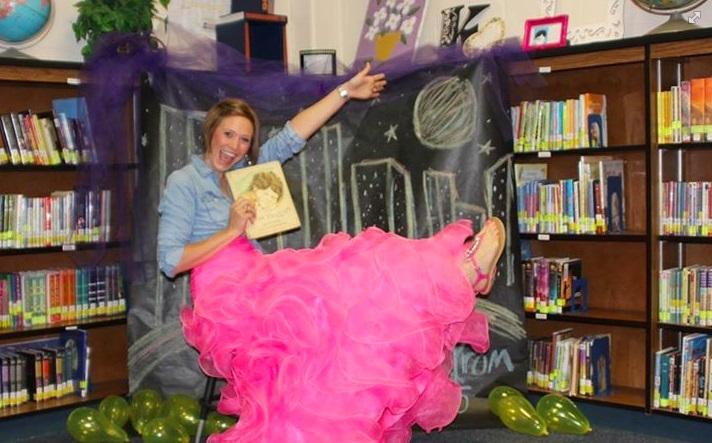 What better way to have fun—and sneak in some literacy—than to have a Book Prom? With my favorite book and fancy dress, I will be attending prom this year… #BookProm! Many of our students have older siblings who went to prom this year, and their parents posted pretty pictures all over social media of prom-goers in all of their finery. I thought that a Book Prom would give parents the chance to dress up the little ones, and give us a chance to talk about books while getting some incredible photographs, too! The first step in attending the prom is to find your date. Your date is not a person. At Book Prom, your date is your favorite book from all the books you read this year. In our school, students have kept reading logs, so remembering what they read throughout the year is a snap. The book selection process offers an opportunity for kids to engage parents and teachers about literature. In those conversations, teachers can prompt students to think about characters, settings, and conflict. It’s a great chance to help bring literature to life for them. Our kids will be working through an end of year literacy review, and they won’t even know it! After students decide who to take to the prom, they must be able to discuss their date with others and try to convince fellow students to vote for their date as Prom King or Prom Queen, depending on the gender of the main character. Students will discuss with the prom participants the parts of the book that were memorable to them. After discussion, I write the book titles on a poster, and each student gets to cast one vote for their favorite title. I have learned over the years that the best way to help kids read is to get their peers to recommend what they like, just like I am always interested in what the coolest and smartest adults are reading! A peer-to-peer book suggestion is a better method for getting kids to read and for helping them grow their literary interests. When the students have finished all their presentations, the kids dance while I tally the votes for king and queen. 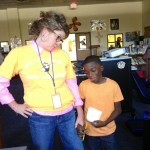 As a librarian and teacher of reading, I am always looking for ways to incite a passion for reading within students. 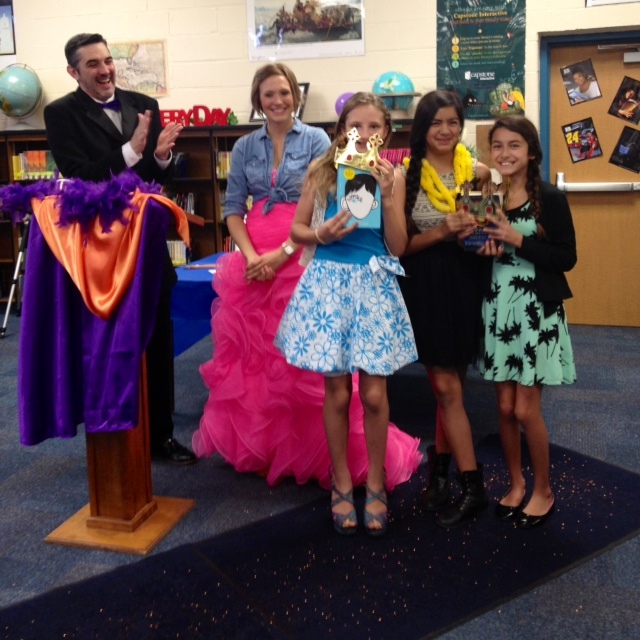 Putting together a prom party to celebrate books was just another sneaky trick to coax students to read more books. I love the prom celebration preparation process. Students get the chance to talk with family and teachers about what they read and analyze what they have read over the course of the year. They prepare themselves to speak persuasively to others about their favored book, and then they get to use what they learn about books they may or may not have read to vote for the title of Prom King or Prom King. For me it’s the perfect storm for literacy circles. 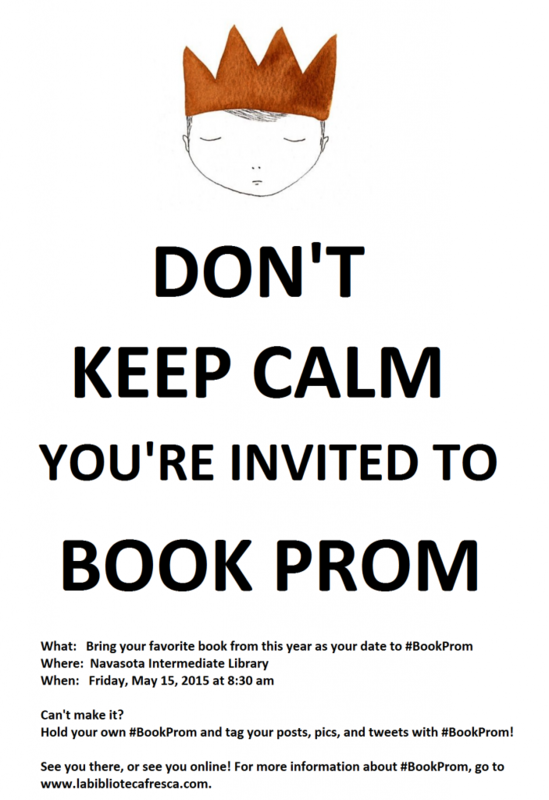 Want to see how Book Prom works in real life? Well you’re in luck! Show up at my little library in Navasota, Texas this Friday, May 15, 2015, at 8:30 am and bring your best book of the year as your date! Book Prom is centered around helping build literacy and love for reading. This prom will be a memorable way to end the school year, and celebrate our kids. If you can’t make it to my little library in Navasota on Friday, you can easily host your own Book Prom wherever you may be. Make sure to use the hashtage #BookProm on your pictures, posts, and tweets. That way we can all enjoy each other’s awesome celebrations of literacy! Using #BookProm will allow students and teachers all over the world to see your innovative ideas in action! See you at the Book Prom on Friday. I CANNOT WAIT!